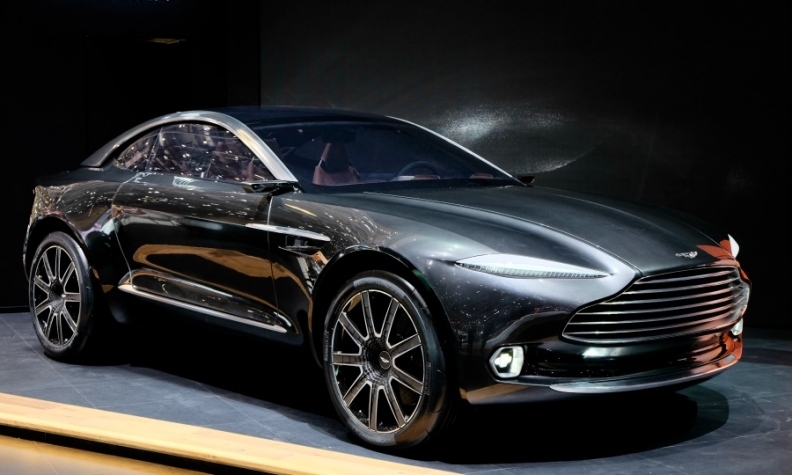 The Aston Martin SUV will be based on the DBX concept, shown, which was previewed in 2015. LONDON -- Aston Martin's first SUV will only be available as a gasoline model, despite being previewed by an electric concept. The SUV will be launched next year into the ultraluxury SUV space where it will rival the Bentley Bentayga, Rolls-Royce Cullinan, Lamborghini Urus, a Ferrari SUV and high-end versions of the Range Rover. The five-door SUV is expected to be called Varekai, Autocar magazine reported in March. The SUV was previewed in 2015 at the Geneva auto show by the two-door DBX electric-powered concept, but Aston Martin's plans have shifted since then, CEO Andy Palmer told Automotive News Europe. Palmer said he had no plans for a full-electric production DBX. He also ruled out diesel and plug-in hybrid versions. Instead Aston Martin will develop an EV platform for its Lagonda brand, which was launched at the Geneva auto show in March with the Vision sedan concept. Aston also showed a scale model of a possible future Lagonda SUV on its stand. Bentley was the first ultraluxury brand to launch an SUV in 2016 with the Bentayga which initially offered only a 12-cylinder gasoline engine but has since added the brand's first ever diesel and a gasoline plug-in hybrid. Palmer said Aston won't follow its British rival. "My belief for a long time is that diesel's life is limited. Ultimately it's dead," he said. He also rejected the idea of a plug-in hybrid. "You've got the [extra] weight and cost of two technologies. It's probably a convenient stepping stone but it's not one we need," Palmer said. For the DBX, Aston is likely to offer its own turbocharged V-12 gasoline as well as a turbocharged V-8 supplied by Daimler's AMG performance arm. The DBX will be built in a new Aston Martin factory in St Athan, Wales, on a platform adapted from the sports car architecture used by the DB11 and Vantage models. Aston Martin won't be alone in sticking to gasoline engines in the segment. Rolls-Royce is likely to offer only a V-12 gasoline engine in the Cullinan, which will be revealed next month. The Lamborghini Urus is a gasoline-only model but the car's MLB platform from its parent, Volkswagen Group, allows the fitting of the same engine range as the related Bentayga. Ferrari is expected to offer its SUV with a plug-in hybrid V-8, media reports said.